This dish was inspired by one of my favorite vegetable dishes: the delicious blasted broccoli at Black Bottle, a wine bar in Seattle's Belltown neighborhood. Tossing the broccoli in a garlicky oil, instead of with chopped garlic, eliminates the problem of the garlic burning while the broccoli roasts at high heat. Roasted garlic is often available in well-stocked olive bars, or you can roast it yourself (see Notes below). Refrigerate the extra garlic oil and use it within three days. I like to brush it on pizza dough before assembling the pizza or use it as a dip for crusty bread. Preheat the oven to 450 degrees. In a blender or food processor, purée the roasted garlic with oil and soy sauce. Taste the oil; it desired, add more garlic cloves, as it should taste quite garlicky. Place the broccoli in a large bowl and drizzle with 3 tablespoons of the garlic oil. Toss until the florets are well coated. 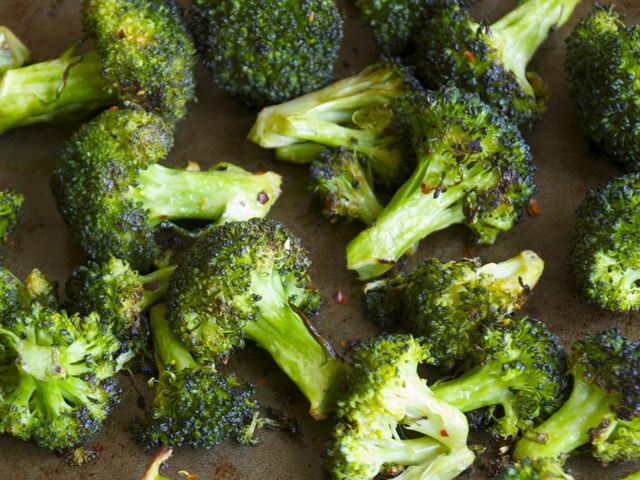 Spread the broccoli on a rimmed baking sheet and sprinkle with the red-pepper flakes and salt to taste. Roast, stirring occasionally, until the broccoli is fork-tender and quite brown and crispy in spots, 15 to 18 minutes. To roast garlic, cut off the top quarter of the head, drizzle with olive oil, and place in a covered baking dish; roast in the oven at 425 degrees until the cloves are soft, about 20 to 25 minutes depending on their size. Refrigerate roasted garlic in a covered container for up to one week. Squeeze the softened cloves out of their wrappers before using in recipes.